Earn 225 - 385 points upon purchasing this product. Use 2250 - 3850 points to purchase this product! We now know that many pathogens adhere to the lining of the gut, colonise, and form a protective barrier around themselves called a biofilm. Microbes use to guard themselves from our immune system. Now we have a solid understanding of why pathogens in the gut can be so hard to treat… they’ve been hidden. PathoGest™ is a unique formula designed to dissolve Biofilms within the body exposing pathogenic bacteria to herbal Paranil™, H-Pylorid™ or anti-bacterial drug interventions. Please always consult with your health professional for the most appropriate to your situation. This biofilm buster can be used alongside herbal protocols such as Candihib antifungal tincture. This page previously contained InterFase Plus by Klaire Labs, PathoGest is our replacement for this item. Biofilm is made up of microorganisms that are encased within a matrix of exopolysaccharides and exoproteins. This matrix adheres to other surfaces‚ resisting dislodgement. The microorganisms encased in these biofilms are highly resistant to antibiotics and other antimicrobials. They are also resistant to the bacteriocins that are produced by probiotics. PathoGest™ was specifically designed to disrupt the biofilm matrix that can embed gastrointestinal pathogens. The specific herbs & enzymes chosen for PathoGest™ were selected because they have been shown in studies to rupture and dissolve the extracellular polymers that are often found in biofilm . These enzymes can also degrade the cell walls of bacteria and yeasts. Calcium‚ magnesium and iron are essential for biofilm creation. The EDTA included in PathoGest™ binds the metals necessary for biofilm formation, depriving them of their resources. According to the NIH, more than 80 percent of human bacterial infections are associated with bacterial biofilm (3). While planktonic bacteria can become antibiotic resistant through gene mutations, a biofilm is often antibiotic resistant for many reasons—physical, chemical, and genetic. Treating illnesses associated with biofilms using antibiotics is an uphill battle. For example, in patients suffering from IBD, antibiotics appear initially to work, only to be followed by a “rebound,” where the symptoms again flare up, presumably due to bacteria evading the antibiotic within a biofilm (4). Diseases Currently Believed to Be Resistant to Treatment Due To Biofilms. 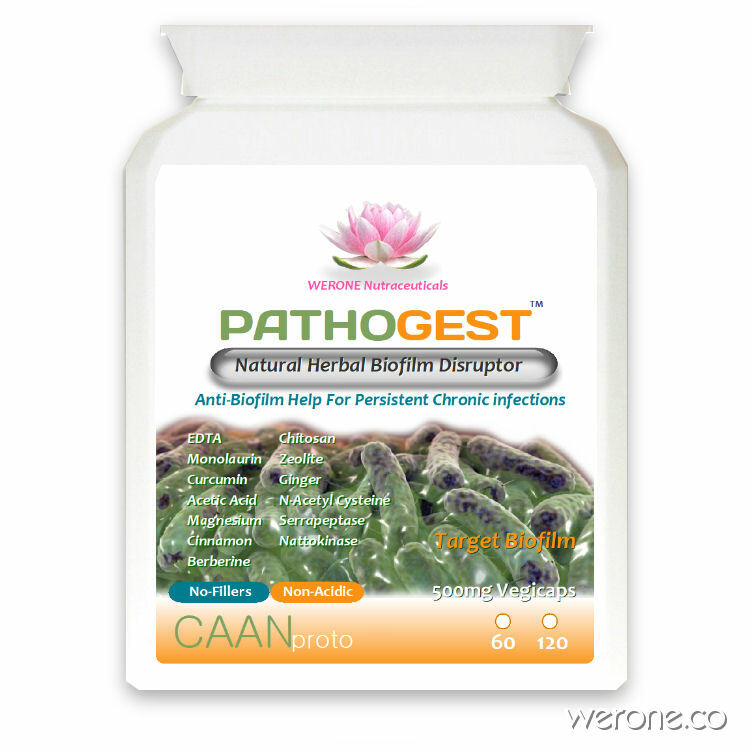 PathoGest™ is intended to be used alongside other efforts to support healthy microflora and gastrointestinal function. In combination with these other efforts‚ it is recommended that after you have completed the 10 day course of PathoGest™ and then Paranil™ that you re-seed the gut flora with a broad‚ high-potency‚ multispecies probiotic as well as a prebiotic formula such as potato starch. This will encourage the production and growth of healthy intestinal microbial biofilm communities – while PathoGest™ is working to eliminate the pathogenic ones. If necessary and directed by your health care practitioner‚ PathoGest can also be taken with antimicrobial agents such as Paranil™ and Monolaurin‚ but take these capsules away from mealtimes to maximize the effects. Caution: Some people will feel worse before they feel better. If you fee achy, flu-like, or nauseous, you could be reacting to the yeast dying off, which overwhelms your body and your liver detox pathways. This is called a herxheimer reaction. Take a full B Vitamin Complex and keep well hydrated also cut the supplements in half or stop them and gradually start back up again. Activated charcoal will help rid the body of toxins and debris. Suggested Use: As a dietary supplement, take 1 to 2 capsules twice daily on an empty stomach / between meals followed by Paranil and Charcoal or as directed by a healthcare professional. Caution: If Pregnant or nursing, do not take this supplement. Contains NO yeast, wheat, gluten, soy, milk/dairy, corn, sodium, sugar, starch, artificial coloring, preservatives or flavoring. Identification of natural compounds which inhibit biofilm formation in clinical isolates of Klebsiella pneumoniae. Monolaurin on biofilm formation in Aeromonas hydrophila, Streptococcus mutans, Xanthomonas oryzae, and Yersinia enterocolitica. 100% Pure Pharmaceutical Grade D-Ribose, boosts energy and endurance, helps maintain cardiovascular health and fitness, and helps rebuild muscle ATP stores. D-Ribose assists the metabolic process of adenosine triphosphate (ATP) synthesis responsible for energy production. Ribose is an essential ingredient in the formation and conservation of cellular energy molecules ATP, ADP and AMP. TCM herbal formula Si-Wu-Tang (Hemo.SWT) which is widely used for women's health. The human breast cancer cells treated with 2.56 mg/ml of SWT showed dramatic gene expression changes. Pathway analysis using differentially expressed genes related to the treatment effect identified that expression of genes in the Nrf2 cytoprotective pathway was most significantly affected by SWT. Five main Nrf2-regulated genes are upreguated by SWT in a dose-dependent manner. Consistently, treatment with SWT and its four herbal ingredients resulted in an increased antioxidant response element (ARE)-luciferase reporter activity in breast and kidney cells. Studies validate SWT's widely claimed use for women's diseases and indicating a phytoestrogenic effect. Phyllanthus emblica Linn. (syn. Emblica officinalis), commonly known as Indian gooseberry or amla, family Euphorbiaceae, is an important herbal drug used in unani (Graceo - arab) and ayurvedic systems of medicine. The plant is used both as a medicine and as a tonic to build up lost vitality and vigor. Phyllanthus emblica is highly nutritious and could be an important dietary source of vitamin C, amino acids, and minerals. The plant also contains phenolic compounds, tannins, phyllembelic acid, phyllembelin, rutin, curcum-inoids, and emblicol. All parts of the plant are used for medicinal purposes, especially the fruit, which has been used in Ayurveda as a potent rasayana and in traditional medicine for the treatment of diarrhea, jaundice, and inflammation. Various plant parts show antidiabetic, hypolipidemic, antibacterial, antioxidant, antiulcerogenic, hepatoprotective, gastroprotective, and chemopreventive properties.